jewelry4less_atl has no other items for sale. 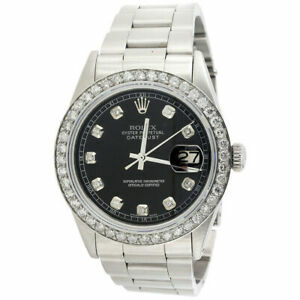 Details about Mens Rolex 36mm DateJust Diamond Watch Oyster Steel Band Custom Black Dial 2 CT.
*$216 for 24 months. Minimum purchase required. Sales tax may apply when shipping to: GA(8.9%), IA*, MN*, WA*. Fast shipping and good product. Thanks. I received the item and I am very satisfied . Thank You. Very good service. Awesome sauce to the letter ! Item: 371001870773 Mens Rolex 36mm DateJust Diamond Watch Oyster Steel Band Custom Black Dial 2 CT. It was delivered very promptly, and was safely packaged. My local Rolex repair shop said I got a good deal. The watch is nice and beautiful, but it is not really a true Rolex watch, despite the subject line saying it is; it is an amalgam of parts, with the band, end-pieces, and bezel being lower-quality non-Rolex, and I guess the Rolex dial is from a different watch. The timepiece and buckle and box are authentic Rolex, but not the watch in its entirety. Description says: "Comes with Rolex Box & appraisal certificate", but the certificate is not by Rolex, despite that wording. The certificate is just by J4L, who is issuing the appraisal themselves for a watch that they are selling themselves, so it isn't really objective/impartial. It works fine, but I'm afraid to open up the timepiece to inspect it, since then it is not returnable. They have a 10% penalty for returns, so I will try to resell it (with a more explicit description), and buy a true Rolex watch for myself. A beautiful watch in excellent condition. Exactly what was advertised. I like this one , I always wanted a Rolex and now i am sure glad i got what it takes to buy one ! Fantastic! Thank you all, Gene F.